Photo: Mediterranean Cottage, ca. 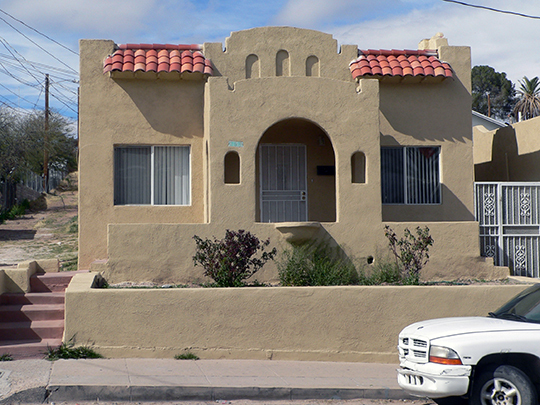 1927, 533 North Potrero Avenue, Nogales, AZ. Listed on the National Register of Historic Places in 1985. Photographed by User:Ammodramus (own work), 2012, [cc-by-1.0 (creativecommons.org/publicdomain/zero/1.0/deed.en)], via Wikimedia Commons, accessed January, 2014. The Santa Cruz County Courthouse is located at 2160 North Congress Drive, Nogales, AZ 85621; phone: 520-375-7812. Named for the Santa Cruz River (spanish, "Holy Cross"), the county was established in 1899. James Woodward, Architectural Historian and Shauna Patton Francissen, Research Assistant, Janus Associates, Inc., Nogales Multiple Resource Area, Santa Cruz County, AZ, nomination document, 1984, National Park Service, National Register of Historic Place4s, Washington, D.C.